Each day there will be another hashtag and theme but everyday we’d like you to use #MuseumWeek (#MuseumWeek +DailyHashtag -see table below). During sign up we’re asking museums to categorize themselves – this isn’t about data mining – this is for you to take the time to look those who signed up and find museums that might have similar collection and start a dialogue. If you have any questions, please tweet @Museumweek or @MarDixon and we’ll try to answer online to encourage those that might be wondering the same thing. We’re suggesting you decide on the time that works best for you. If you can only designate 11-2 each day, then explain that to your followers. Should I use both hashtags in every Tweet? ​Yes please – but if you can only fit one, make it #MuseumWeek if possible. What if our museum is closed/being renovated? You can still take part and encourage your followers to be creative with the hashtags. This seems like a lot of work – we don’t have the staff for this. This is completely flexible. We don’t want this to be a burden – this is fun! Just put in what you can. 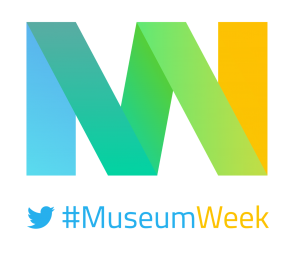 ​Before #MuseumWeek, engage with other museums on the list. This could be like-minded museums or maybe a museum from another country you’d like to collaborate with! GET INVOLVED – jump into conversations even if they are not directed to you. DON’T MARKET – this is a week to highlight the great outreach and collection of museums. Don’t use it for marketing. BE SOCIAL – Have a bit of fun with the hashtags. ASK QUESTIONS – As a museum, be the leader in asking other museums questions. There is always room to learn. HAVE FUN – don’t be overwhelmed with the hashtags – just enjoy it and use it as a chance to engage with new international audiences. Slogan: “Museums and visitors share your souvenirs! From past visits to modern, share your treasures from those lovely museums shops. ”Examples : Badges, pencils and stickers are always good but what else is collected by visitors? Have you started a collection from visiting museums? Additional Information: When you visit a museum, take a look at the building that holds the collection. Pictures, Vines, vidéo, animations, comic stricts, etc. For history: Historical objects – many to choose from. Additional Information: This is to celebrate the work done by museum (for all) educators but also provide a opportunity for families and home educators to share their passion of museums. Examples: All contents for young people (online and in the Museum) that can be done alone or with their families. Educators share your education packs, trails, family kits. Encourage Young People groups to share on the day. Home Educators will be asked to share. Visiting with diverse families. Examples: Museums encourage your visitors to share their favorite highlights of their visit on the day. Content can also be found online. Vines and Pictures. Slogan: Picture yourself in the museum, pose and interact with its contents and exhibits! Are you a museum piece? A work of art? Additional Information: Posing not selfie! Examples: Posing as works of culture; recreating works. Could be in front of or from online picture/postcard. mimic. tribute. i.e. van gogh. Encourage your friends and family to get involved. Look forward to ‘seeing’ you during #MuseumWeek.